The fighting conch is a great addition to any tank with a natural sand bed. These creatures are great foragers and sand sifters that will aerate the sand very well. These snails are easily identifiable by the shape of their shell having a point at both ends with a ridge located about 2/3 of the length of the shell with spiky protrusions. There is also a notch near the bottom point where you can often see the foot and eye of this snail sticking out. The aggressive name it has been given is more so due to this intimidating appearance rather than its actual behavior. Where is the Fighting Conch Found? Are Fighting Conch reef safe? What do Fighting Conch snails eat? What type of behavior can you expect from an Fighting Conch? 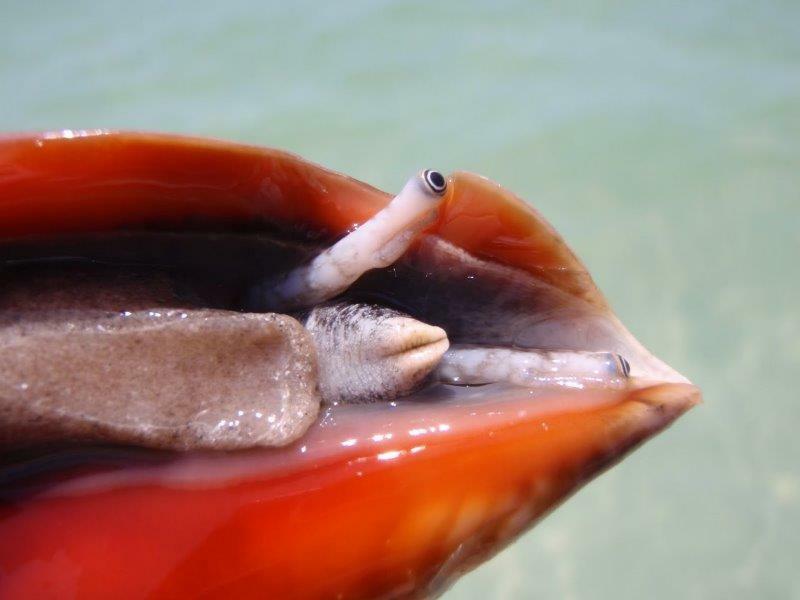 How do Fighting Conchs reproduce? What are some good Tank Mates for the Fighting Conch? What is the Lifespan of a Fighting Conch? What Tank size is recommended for this snail? The fighting conch or Strombus pugilism is most commonly found in the waters of southern Florida and down into the Caribbean’s. They are also found in Bermuda and as far south as Brazil. They like to live in sandy and muddy bottom waters primarily in the intertidal zones. They will generally be found in waters between 6’ – 30’ deep. The pugilism snail is commonly mixed up with the alatus which is from the same family Strombus. These are typically found in climates further north. To distinguish the alatus from the pugilism you have to look at the flare of the opening lip and the prominence of the spikes on the shell. Unfortunately, this could just look like a younger pugilism and is why they are often treated as the same species. Outside of these small visual cues and climate preference there are no major differences. The fighting conch is extremely reef safe and makes a great addition to your clean-up crew. They love to forage for food in the sand bed and will do a great job aerating the sand. The fighting conch is an omnivore meaning it will eat many things. It’s primary data food source will be the detritus (fish poo) and left-over food that falls to the bottom of the tank. They will also graze on green algae as they move from one pile of detritus to the next. 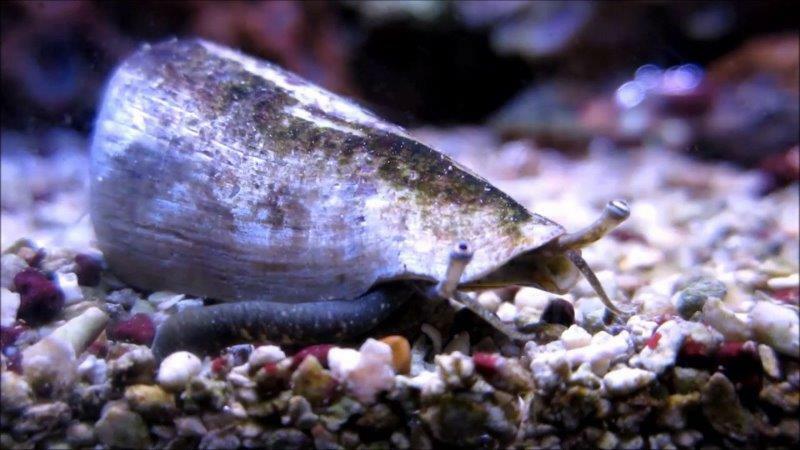 The fact that they will eat both is what causes many hobbyists to add them to their tank since so many other snails are typically one or the other. The most common colorations that are found of these creatures is ivory, brown, green, and some pink. They will often be a mix of the previously mentioned colors. Aqua cultured specimens are beginning to have an even more varied coloration scheme possibly due to the lack of need for camouflage as well as the light coloration of the reef tanks. 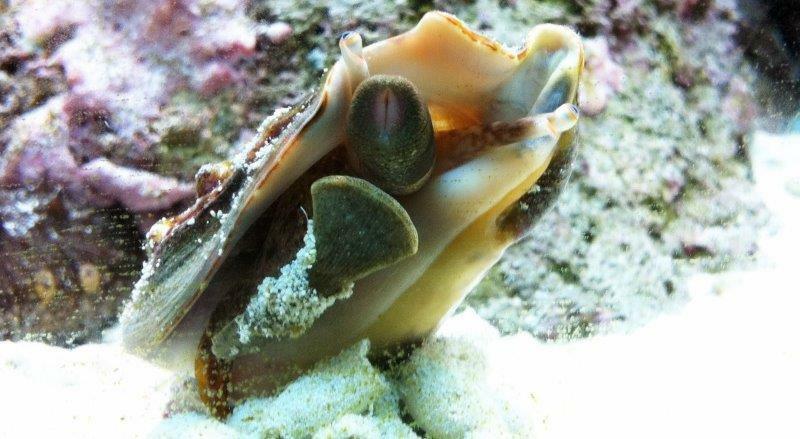 Like all invertebrates, the fighting conch is highly effected by rapid changes in their water climate. For this reason, it is best to drip acclimate them. You can successfully float them adding small amounts of water to your bag over a few hours but dripping will give the best slow acclimation. How do Fighting Conch reproduce? If you have had any luck breeding these, please share your experience in the comments section below. Most any reef safe creature will be good for the conch. The conch is not going to be aggressive to its tank mates unless they are male and will then be aggressive to other males in their territory. If housing more than one male, larger tanks are required to give them plenty of space. The biggest concern with tankmates will be anything that eats snails. Things like puffers, triggers, hawk fish, etc. are out unless you are offering up conch for dinner. Hermit crabs should also be housed with your conch under extreme caution. 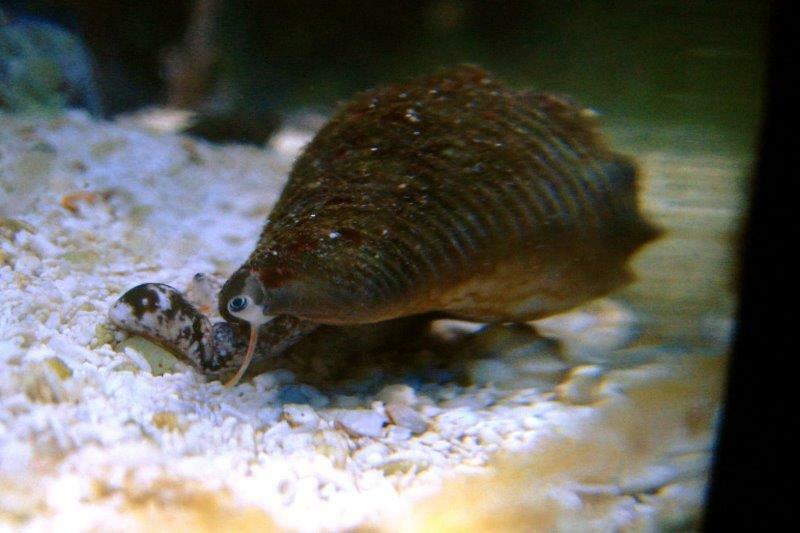 Hermit crabs will not hesitate to go after your conch just so they can get a meal and new home all in one swoop. If you mix the two make sure there are plenty of empty shells around the tank so the hermits do not start looking at new real-estate. The conch has an average life span of 7-10 years. This is a very long time in aquarium years giving them good longevity if taken care of. What Tank size is recommended for the Fighting Conch? If it is kept as the only one of its species it can be in even the smallest of nano tanks. The bigger concern when considering space is how much sand bed is there. Make sure there is enough sand bed for all of them to forage in and if the sand bed stays fairly clean provide them with additional feeding of dried sea weed and frozen fish foods. If you are looking for a unique and eye-catching addition to your tank you have found it. The fact that these snails are also peaceful, sand sifting, detritus & algae eaters makes them even better candidates for your tank. The only reason I would not add at least one of these guys is if I had creatures in the tank that would not hesitate to eat snails. For the average reef keeper this is a general concern though and one we face with all of our additions to the tank. What is your experience with this snail? Let me know in the comments below.